A lot of planning goes into building a new home. From determining the perfect exterior look, to selecting the fixtures for each room, each decision is a process. Planning for a septic system is no different. If you are building a new home where sewer is not available, there’s a high probability you will need an On-Site Sewage Facility (OSSF), better known as a septic system. Unfortunately, there is not a one-size-fits all system and many factors need to be considered during the design process. A TCEQ Licensed Site Evaluator will evaluate your property and soil type to determine the type of system needed for your lot. A TCEQ Licensed Engineer or Registered Sanitarian to design the system. The designer will take the information provided by the Site Evaluator, along with system sizing requirements, to begin the design. The system design must be approved and permitted by the local Designated Representative (usually the county in most cases in Texas). The system must be installed by a TCEQ Licensed Installer I or Installer II, depending on the system type. The installer will coordinate inspections with the Designated Representative during the installation process. The Designative Representative will then issue a License to Operate the system once all inspections have been completed. During this process there’s a good chance you may have to hire three contractors: a site evaluator, a designer, and an installer. In some instances, you may only have to hire two contractors as some site evaluators can also provide the design. Other contractors, and companies like ours, provide turn-key installation meaning you hire one person for everything. The process doesn’t end once the system is installed. 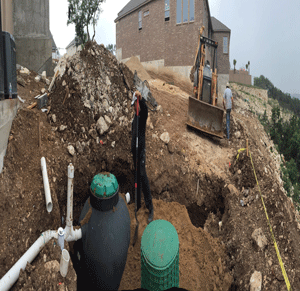 Every septic system and aerobic system requires ongoing maintenance. The level of maintenance depends on the system type and usage. Click here for more information about system maintenance. If you are looking for a turn-key installation process, give us a call at 830.249.4000 (Boerne) or 210.698.2000 (San Antonio) or contact us online to schedule an appointment. We do everything, from start to finish, saving you time and hassle. We have over 78 years of installation experience –providing you with the most qualified and experienced professionals.